The AIA St. Louis Board of Directors supports and promotes AIA public policies and serves as the governing body and official voice for all local AIA government affairs. 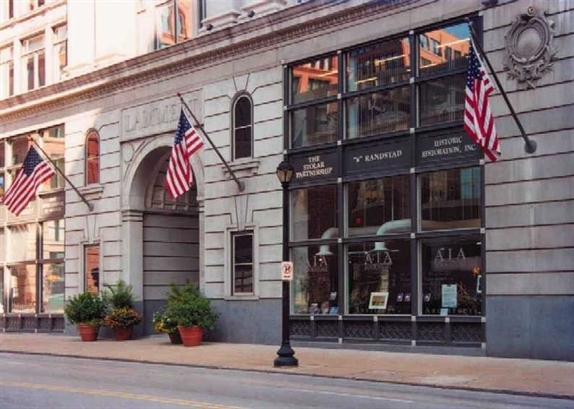 AIA St. Louis adheres to, promotes and complies with the AIA National policies and practices. Public Policies are AIA statements of belief to policy-makers, the public, and the construction industry on issues of public policy affecting the membership, the profession of architecture, or The American Institute of Architects. To read the Public Policies of AIA National, click HERE. It is the practice of the American Institute of Architects and its members to comply strictly with all laws, including federal and state antitrust laws, that apply to AIA operations and activities. Compliance with the letter and spirit of the antitrust laws is an important goal of the AIA, and is essential to maintaining the Institute's reputation for the highest standards of ethical conduct. To read the AIA Anti-Trust Compliance Statement and Procedures, click HERE. The AIA 2030 Commitment is a challenge set forth by the AIA to its member firms to take a leadership role in reducing the energy consumption and green house gas creation in the buildings we design and operate. The topic of energy performance has begun to move to the front of all decisions we make—both how much energy is used by the firm in its daily business processes, as well as energy performance of the projects designed within the firm. This initiative brings into focus each of these topics and acknowledges their importance. To view 2030 Commitment Resources, click HERE. Canons are broad principles of conduct. Ethical Standards (E.S.) are more specific goals toward which members should aspire in professional performance and behavior. Rules of Conduct are mandatory; violation of a Rule is grounds for disciplinary action by the Institute. Rules of Conduct, in some instances, implement more than one Canon or Ethical Standard. To read the AIA Code of Ethics and Professional Conduct, click HERE.